I’m going to share a repair I did on a little bisque Nancy Ann Storybook Doll using Apoxie Sculpt. Nancy Ann Story Book Dolls are the first dolls I collected in my youth (with my own money). I used to find them at flea markets and they were cute and inexpensive. 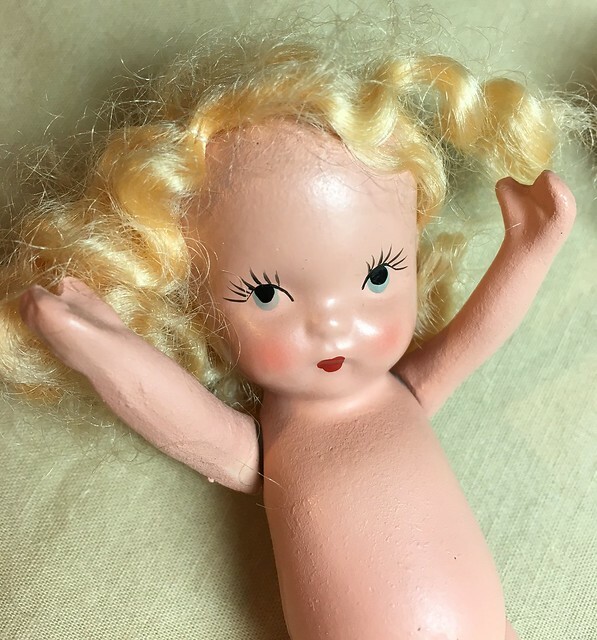 My favorite of their dolls are the tiny bisque dolls made in the 1938 – 1942 time period. Every now and then I like to poke around on eBay, looking for a bargain on one of these old charmers. 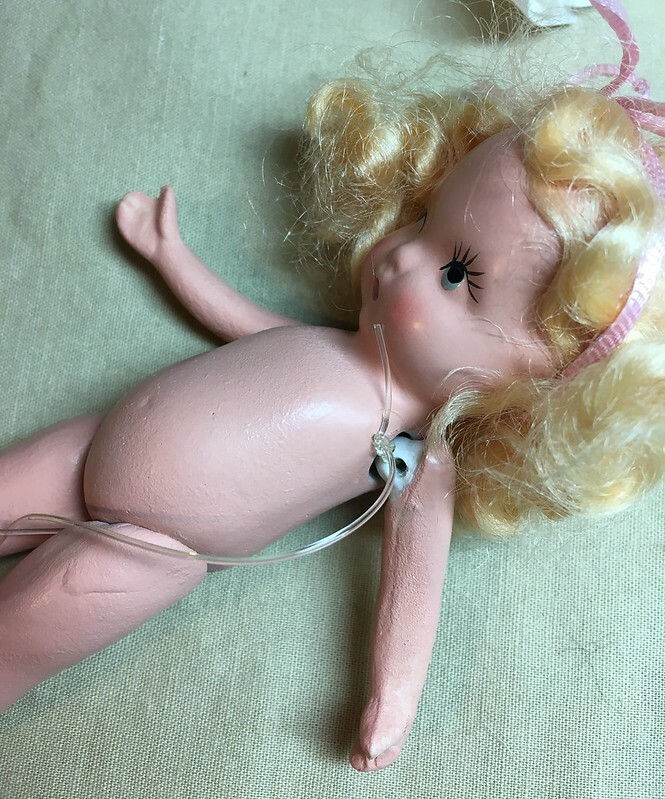 These dolls often have some breakage – they’re nearly 80 years old now after all. The doll I’m sharing today has an extremely common problem: hers arms are detached because the top has broken off. 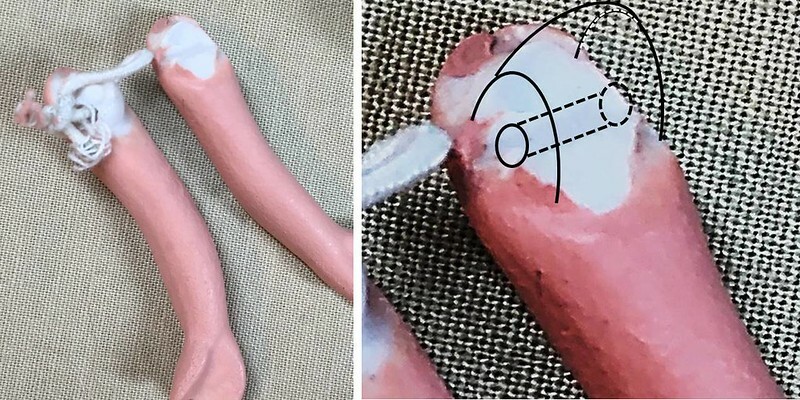 The arms are held on with a little piece of elastic that runs through a knob with a hole through it. It’s all one piece with the arm. Under stress from the little bit of tension from the elastic, it must just snap off. You see this particular break often. 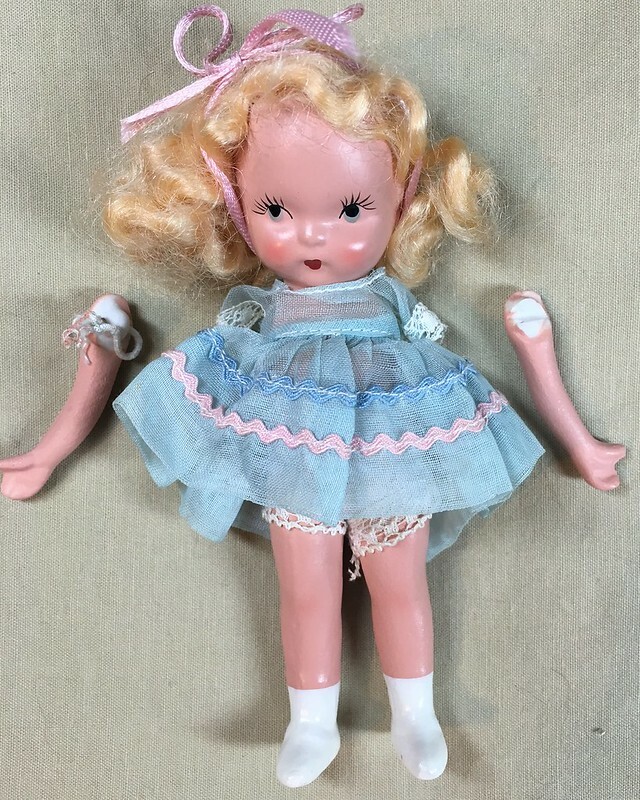 Many people will buy another doll in poor condition to be an arm donor. There’s no need though, these dolls are usually bargains and very fixable. Apoxie Sculpt is a two-part modelling clay. It hardens overnight and doesn’t require baking. When dry, it’s extremely strong and feels like plastic. It adheres to almost any surface so it is great for repairs. I use it for modifications to ball jointed dolls because it works well with resin. It also adheres well to bisque. It’s a little smelly, sometimes I’d like a bit more working time, and you need to clean your tools promptly—but those are the only drawbacks. Use an equal volume of part A and part B. Knead with your hands until it is completely mixed. It will be very pliable and putty-like. Work quickly. After about 15 minutes, it will begin to get a little warm and to stiffen, so only mix as much as you can use in 20 to 30 minutes. I used a silicone tipped sculpting tool to smooth the clay and push it firmly into the bisque. These are great tools if you work with clay but if you don’t have sculpting tools, a toothpick will work. I used a sewing needle to make the hole through the knob. Apoxie Sculpt comes in a variety of sizes. If you buy more than you need (like I did), it will last longer if you keep it tightly closed in the freezer. Mine is now really old (really really old) but it still worked great. Fresher product is almost certain to be better, but after years in the freezer it worked great for this repair. Just thaw it a few hours before using and return to the freezer when finished. Let the clay dry overnight, and it’s ready to reattach. I’m going to restring her arms with beading elastic instead of her original elastic. The old stuff is too short to re-tie but is still surprisingly springy after all these years. String it through the body and through the 2 arm loops then tie it with a big knot. Tuck that ugly knot inside, and she’s all fixed. You can get Apoxie Sculpt from Amazon and many art supply stores. It’s extremely versatile and useful. 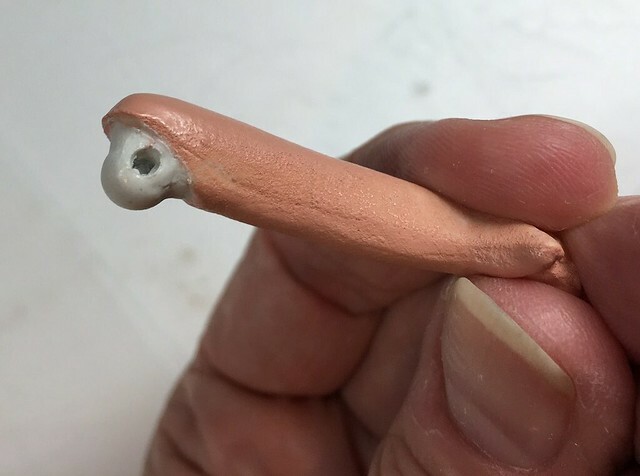 Many doll artists sculpt with it. I’ve mostly used it for hidden applications like internal repairs and armatures. It doesn’t shrink much and it’s paintable. You can get various sizes and colors. It’s very permanent – if you stick it to something, getting it off later will be a challenge (probably impossible). It doesn’t stick to silicone though so you can use it in silicone press molds. Very fun. 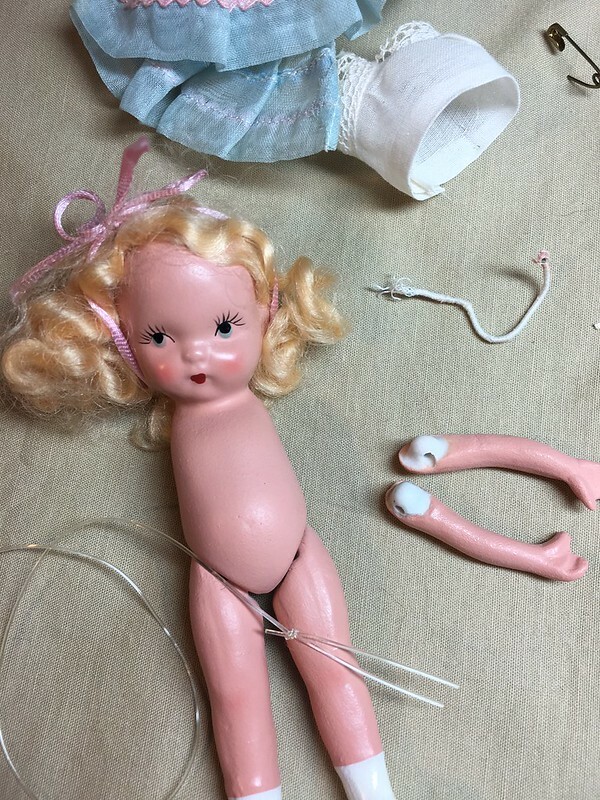 Next time you have a repair challenge, consider Apoxie Sculpt and, next time you see a great old doll that needs some TLC, give it a shot. “Goldilocks” made by the Nancy Ann Storybook Dolls Company, circa 1940. She is a 5 1/2” bisque doll with a handpainted face and mohair wig. Nancy Ann Abbott, a former actress, started the Storybook Dolls Company in California in 1936–in the midst of the depression. 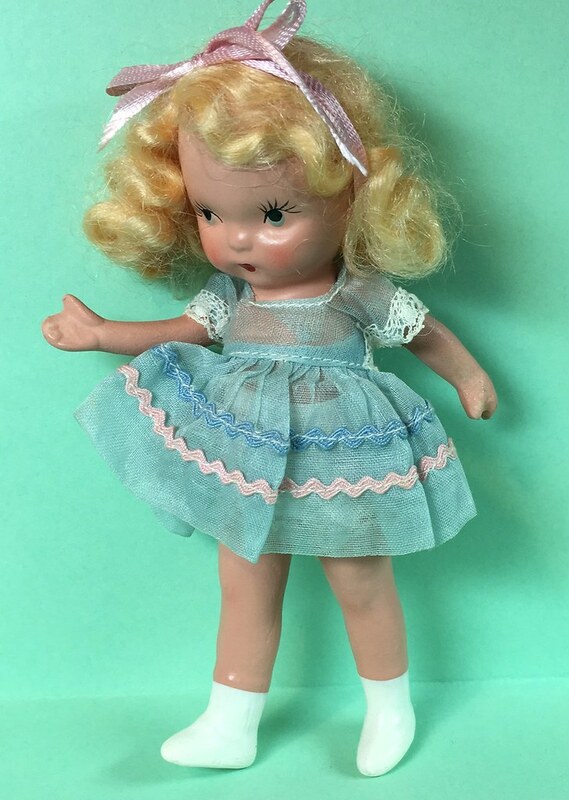 The dolls soon became extremely popular and many girls had large collections. The company joined the war effort in the 1940s by manufacturing dishes for the US Navy but continued to produce dolls. At their height, they made thousands of dolls daily, exported worldwide, and were the most productive toy company in the US. Despite their adaptability, the company went bankrupt in the 1960s. The decline was due in part to the illness and eventual death of the company’s founder Nancy, and her partner, Les Rowland. But I think that vixen, Barbie had something to do with it also… The doll world was changing dramatically. 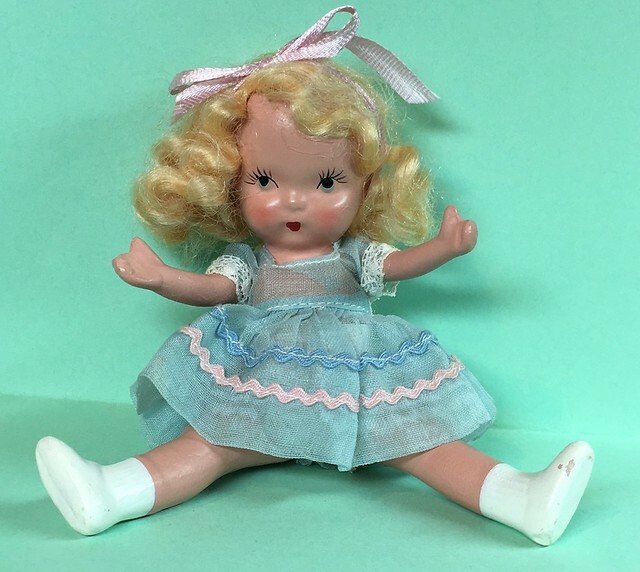 Many grandmothers had these dolls as children and new collectors are discovering them. Since only the oldest dolls are rare and expensive, creative people are buying them and fixing them up in fun and expressive ways. 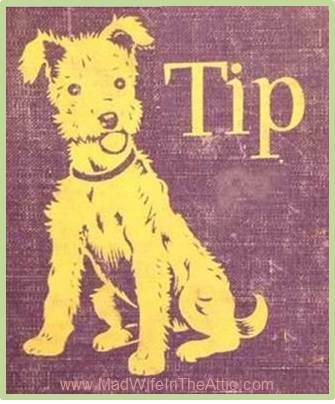 If you aren’t already a Nancy Ann Storybook fan, look for them on eBay and at flea markets. They also make great toys for other dolls. Dollstown “Deogi” with friends. Deogi belongs to my friend, Monica. I painted her face and blushed her. 05 Jun	This entry was published on June 5, 2016 at 5:12 pm. It’s filed under Modifications, Tips, Tutorial, Vintage Dolls and tagged Apoxie Sculpt, Crafts, Doll, modification, Nancy Ann, NASB, Robbin Atwell, Storybook Doll, Tutorial. Bookmark the permalink. Follow any comments here with the RSS feed for this post. Older: Souldoll Yewon: A face without freckles is like a night without stars. Newer: But She’s a Nice Vampire! This is amazing! So can you do this on composition dolls that need some repairs?